Soft and cuddly – just like a koala! 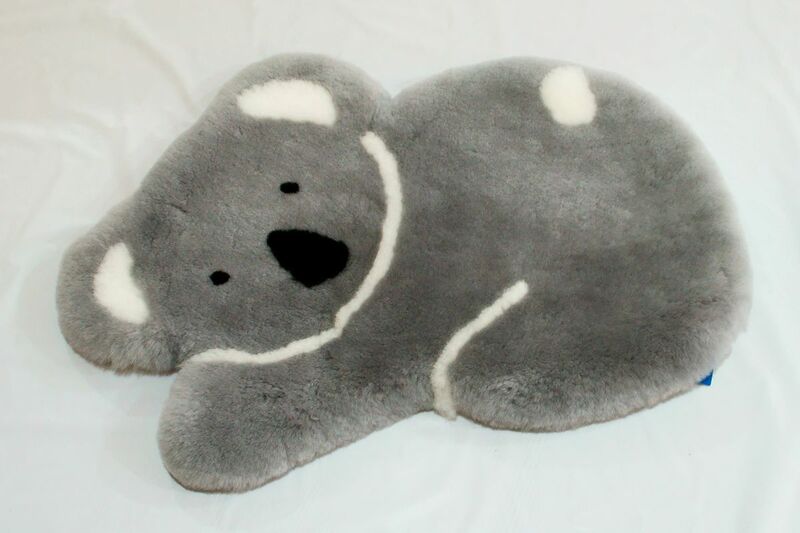 This flat sheepskin koala is natural, plush and luxurious – it’s perfect for babies, kids – anyone! It has a zippered pocket at the back to tuck your Pyjamas into or fill with cushion padding for an extra snuggly cushion to watch TV. This koala is made from ecologically friendly products, what is called EcoTanTM. EcoTanTM tanning uses the most environmentally friendly and technically advanced tanning agents with the end results being products that are free of health harming chemicals that is still used in some other products out in the market place. These products are not only safe for use by you, but are also friendly to the environment. Now that is a breath of fresh air! Koalas are one of Australias most iconic species and are not related to bears. Koalas are simply just that – a Koala. The Koala is a marsupial which means they have a pouch in which they raise their joey. Koalas are mostly nocturnal. Koala fossils have been found in Australia have been dated as long ago as 20 million years! Koalas have individual finger prints, just like we do and if you look closely at koalas, you’ll find that you can identify them from their noses! Koalas live in the eucalypt forests of Queensland, NSW, Victoria and South Australia. They are very fussy eaters and are picky about which species of gum leaves they will eat. Habitat loss is the greatest threat to koalas. The main reasons for this are land clearing, bushfires and diseases of the eucalypts which is called die back. Vehicles and dogs are also a big threat to koalas. Check out koalas online – you can help save Australia’s iconic koala.